This online Confined Space Awareness training helps employees who work in the vicinity of confined spaces to meet the Confined Space training requirements per OSHA standards. 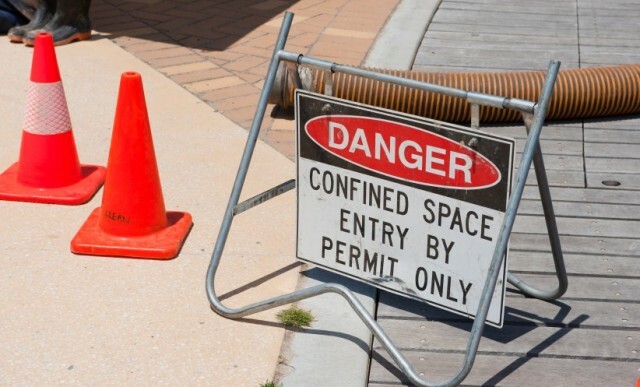 Workers who actually enter confined spaces should NOT take this course, since hands-on training and practice are critical prior to confined space entry. This OSHA Confined Space Awareness training online course is designed to help employers and workers meet the Federal and State OSHA Confined Space Training Requirements outlined in OSHA regulations. The course should be taken by employees who work in the vicinity of confined spaces. This course should be used as one training tool within a more comprehensive Confined Space Program designed for employees, which includes training on the hazards, equipment, policies and procedures specific to the job. The course is NOT intended for workers who must actually enter confined spaces, since hands-on training and practice are crucial elements in gaining the necessary skills and knowledge needed for confined space entry. For information on OSHA Safety training requirements or the Safety training courses we offer, visit our OSHA Safety Training page. This confined space awareness training online course includes up-to-date, high quality training designed with your learning as our top priority. The course features interactive training, which combines audio and visual elements for maximum retention. The course is completed entirely online using a computer with an internet connection. Students use our state-of-the-art Online Training System (OTS) to log-in to the course, which is available 24/7. We are so certain you will be satisfied with your experience, that we offer a 100% Money Back Guarantee*. The course should take approximately one hour to complete. Confined space defined | Permit-required confined space defined | Elements of a confined space program | Controlling hazards | Equipment for safe entry | Detection of hazardous conditions | Contract employees | Entry permits and contents | Worker training and training requirements | Assigned duties | Authorized entrants, attendants, entry supervisor | Emergencies | Rescue service personnel | Harness and retrieval lines | Material safety data sheets. The objective of the Confined Space Awareness online course is to help employers and workers meet the Federal OSHA Confined Space Training Requirement outlined in OSHA regulations. It is intended that State OSHA Confined Space training requirements be met as well. The employer shall certify that the training required by paragraphs (g)(1) through (g)(3) of this section has been accomplished. The certification shall contain each employee’s name, the signatures or initials of the trainers, and the dates of training. The certification shall be available for inspection by employees and their authorized representatives. Within our Online Training System (OTS), this course consists of the 1 section listed below. A 70% or better score is needed in order to pass the final exam. If a student does not pass, they may re-review information in the section as necessary, and retake the test as many times as needed in order to pass. The Confined Space Awareness training course is designed to help employers and workers meet the Federal OSHA Confined Space Training Requirement outlined in OSHA regulations. It is intended that State OSHA Confined Spaces training requirements be met as well. Once the online course is completed, you will immediately be able to download, save or print your confined space Course Completion Certificate which is provided in PDF format. To learn more about this topic, see OSHA’s Confined Spaces page, which includes information on confined spaces standards and enforcement, OSHA compliance, confined space hazards, and additional resources. Please note that this confined space awareness course provides valuable information which applies to the general population of employees who work in the vicinity of confined spaces. This course is not meant to replace company-specific training provided by your employer on equipment use and procedures for your particular work environment. You must be trained by your employer on the hazards, equipment, engineering and administrative controls, safe work practices and emergency plans specific to your role and workplace.